(CNN) - Surrounded by family and friends, former President George H.W. 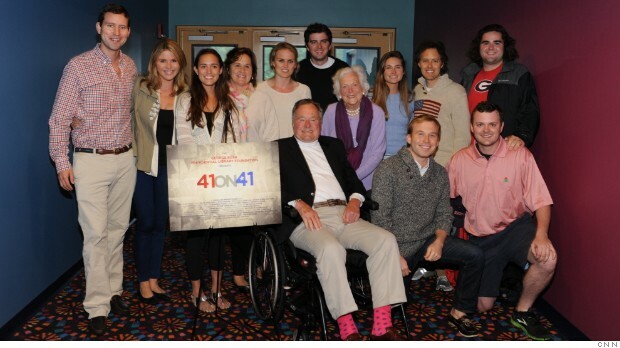 attended an advanced screening of “41ON41” on Friday as part of his 90th birthday festivities. The film is about the life and legacy of President George H. W. Bush, as told by interviews with 41 people who know him best. Executive Producer Mary Kate Cary shared details about the event with CNN. "Before the film began, the audience of over 400 people was treated to footage of the President’s skydive the day before, accompanied by “41ON41” interviewee retired Sergeant Michael Elliott of the U.S. Army Golden Knights," Cary said. The standing-room-only crowd included several of the 41 interviewees from the film, including Bush's daughter Doro Bush Koch. "'41ON41' is a wonderful portrait of an amazing man through the voices of 41 people who know him well," Koch told CNN. "I'm excited for the world to know more bout my extraordinary Dad." Other guests included Bush's grandson Pierce Bush, former Bush Secretary of Transportation Andy Card, former Bush White House Press Secretary Marlin Fitzwater, President Bush’s current chief of staff Jean Becker and former First Lady Barbara Bush. The audience also included over two dozen Bush family members, as well as former White House senior staff members and local friends and neighbors, according to Cary. The movie was shown at the 14-screen Cinemagic Theater in Sacco, Maine near Bush's Kennebunkport home. To add the celebration, Cary tells CNN that the theatre the screening occurred in, theater #9, was fittingly renamed theater #41 for the night. I want you to accept my congratulations to your illustrious Excellencies. I'm the girl who actually love your daughter and I'm looking to marry her, all this in a tone of sincerity and honestly I'm elucidate you what I'm feeling like a man with a wife to seek the truth. Much love your daughter Barbara Bush and my pretension to her marriage and is not zombar.E is what led me to write this letter to you guys exclarecer my pretense, and I am glad satisfazeram my wishes, because I sincerely want form a good family with her. Thanks and accept my best wishes and greetings as a fascinating coineds. Watching 41 on 41. I am not a regular CNN viewer, but this was very well done. As Naval Aviator George H. W. Bush would say: "BRAVO ZULU"
I can't wait for the sequel " 43ON43 ". the suspense is killing me . Good. Enough of any of the bushes!